We are so grateful to our customers for all their kind words. Most dog owners connect with us on social media and it is so fun for our family to see our puppies grow up. Here's what a few of our customers have been saying about us. I have never had a better experience with a breeder in my life. In January of 2016, my family and I lost our beloved GSD Nova after a bit more than 11 years. As with the loss of any animal in your world, it’s devastating. But being this was our third GSD, I have learned that they leave an even bigger, more powerful void, because they are such an incredibly different breed of dog. I knew we would get another – but this loss hurt more than others. I needed time to heal. One day, late last June while surfing the net, I googled GSD puppies, breeders, Denver Colorado. 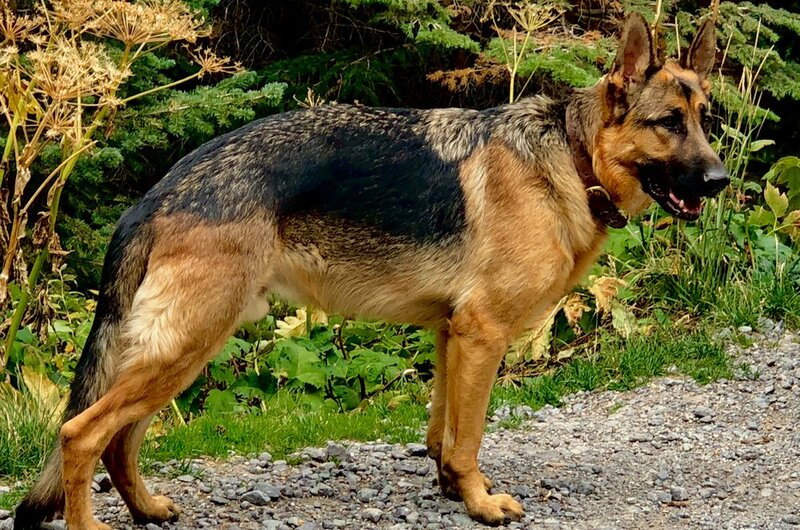 One of the results came up Casimir German Shepherds. I called their number and left a message, expecting to hear back from them days later, as was the case with most breeders I had dealt with in the past. I heard back from Tracie the next morning. We talked for about 20 minutes and I agreed to take a ride out to their location. What I found, blew me away. Home to their latest litter, along with three other adult Shepherds, the adult dogs, mom included, came over to us and, after a thorough sniffing, allowed us in. The puppies were confined in a large and well maintained area. They had access to the house and, as Tracie said with a smile, ‘were constantly underfoot’. They interacted with the adult dogs, each other, even the horses (at a safe distance mind you). The entire family was involved in the socialization of these pups and you could see it immediately. Not only were the dispositions of the adult dogs incredible, the puppies were involved, engaged and happy. There were no cages, no separation. One big happy family. We were so impressed my wife insisted we reserved a female immediately. We did. We have never regretted a moment. The socialization and early training these pups received courtesy of Tracie and her family created a kind, gentle, sweet, well adjusted and completely devoted puppy, our Kaiya. At 8 months old this January 22nd, she is everything we ever wanted. I will always miss my Nova, along with my other two Shepherds. But Kaiya is a worthy addition to their line, possibly the sweetest animal I have EVER worked with, and blessed with having been born and raised by a family committed to bringing GSD puppies the best start to life they could have. 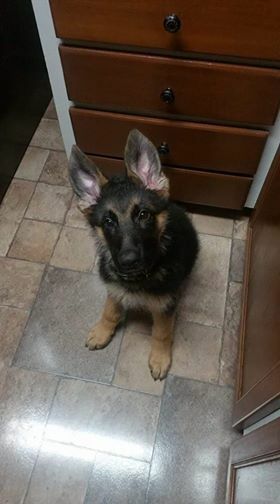 My family and I feel blessed to not only have discovered Casimir GSD’s, but are grateful and appreciative of all Tracie and her family do to provide people with smart, loving, well adjusted puppies. Best of all, they stay involved, so you can discuss problems, ideas and have questions answered as your puppy grows and changes. You simply cannot go wrong taking home one of their litter and I urge you to visit them if you are at all considering a GSD to complete your home. Kai continues to be awesome. Gosh, I love that dog. Kai is wonderful, smart, beautiful, and so sweet! I hope these two pictures come through. I can certainly speak of Kai's temperament and intelligence! I am in awe of this guy. He is huge! I love the German shepherd breed and over the years have had several, but I've never had one like him. I could go on and on. He's truly my Rin Tin Tin. (You're probably too young to know who Rin Tin Tin was. 😊) I love talking about him, as you may tell. Kudos to you for breeding such outstanding dogs!! Kai has filled a hole in my heart that I didn't know I had. Weighing in at 95lbs and he is only 10 months!!! Can't wait for you to see him. He prances at the trot. When he has a treasure in his mouth he looks regal. I may be biased, but he his a gorgeous, gorgeous dog and life without him would be intolerable. Thank you for my amazing dog. Ember is amazing. She really loves people, always ready to say hi to who ever walks in the door. She is very good with other dogs and enjoys going to the dog park, but tends to be skittish the first 30 seconds we are there. She is fully packed with a lot of personality and she loves to "scream" at people when she gets frustrated while playing or when we get home(I'll have to send a video sometime). She is very gentle with our yorkie and young children that have come to visit. She goes outside and sits in front of the fence every day around 10 o'clock to watch the squirrels run across it ( funny that the squirrels bark at her but not the other way around). She loves walks more then anything but still needs to find out the difference between a walk and a sprint. We have a morning routine when I leave for school she walks me out the door and tries to stop the door from closing with her nose. She is such an amazing dog, and I'll never be able to thank you enough for her. She is my best friend.... and I'm now known as the crazy dog mother. Always got a few new pictures to annoy my friends with! Thanks for asking about her. Hope your new litter of puppies do well. Tracie and her family take such great care with the pups they breed. We got Kane about 2 years ago and the experience was great. We had a visit to check out the litter and meet Mom and Dad The process was great and we wouldn't know what to do without our pup. We met Kane at 6 weeks old and had to wait until the 8 week mark to take him home. Tracie send adorable pictures through out the 2 weeks and is awesome to work with and talk to. Thanks for all your help and information! We bought/adopted our Macie from Tracie and her family. She is beautiful and well tempered with our children. We couldn’t imagine life without her. If/when we are ready to expand our furry family we will be going back. After searching German Shepherd breeders in Colorado, we are so happy that we chose Tracie and Casimir German Shepherds. From initial contact, through the birth of the pups, until the day came when we went to pick up our little Bentley, Tracie kept us continually updated with not only the weekly status of the litter but also with weekly photos. Tracie was always available and promptly answered all of our questions or concerns. We wanted more from our breeder than just the source of a puppy, and Casimir German Shepherds met all our expectations. The care and attention Tracie gives to her puppies clearly shows and we could not be happier with the entire process. Thanks again Tracie for everything, especially for our sweet little Bentley. We are so blessed to have him as the newest member of our family!
" This is our best boy Uli. He is the most affectionate, loyal, intelligent, kindest, sweetest dog I’ve ever had. Absolutely reliable. Great with infants up to WW ll vets. He’s perfectly socialized! Other dogs, disruptions, noise and new surroundings don’t raise a hair. The Wenzel’s are producing the best character, prettiest, GSD’S anywhere. I highly recommend this line for companionship and family life."